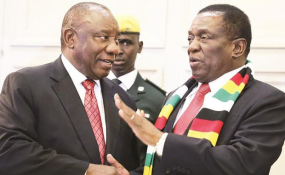 South Africa has extended 55 million rand to Zimbabwe to be channelled towards police training and protective gear required in policing activities. The area of police training and skilling is one of the areas identified in the Montlanthe Commission on last year's post-election violence which President Mnangagwa is implementing among a raft of other reforms. Pretoria also handed over a humanitarian package to Zimbabwe on behalf of a South African non-governmental organisation Gift of the Givers. This follows the successful two-day Zimbabwe-South Africa Bi-National Commission held in Harare, which ended yesterday. South African Ministers of International Relations and Cooperation and Transport, Lindiwe Sisulu and Blade Nzimande, respectively, handed over the package to their Zimbabwean counterparts, Foreign Affairs and International Trade Minister Dr Sibusiso Moyo and Health and Child Care Minister Obadiah Moyo, at the South African Embassy yesterday. Speaking during the handover ceremony, Minister Sisulu expressed hope that the donation would be on an ongoing basis. "The package that comes from myself is to assist through you minister in the training of the police and in making sure that they have the necessary protective gear to make sure they are equipped. We have realised they are very busy," she said. "We therefore decided to donate this for the time being. We are hoping this would be on an ongoing basis. The necessary resources for their training and the necessary resources for the equipment that they will need for their training whatever else that goes with it." "The initial sum that we could find from our reserves is $55 million rand which we are now signing off. We are hoping that we can continue in this relationship and we are glad that you reached out to us." Dr Moyo thanked South Africa for the gesture. "The fulcrum of any economic development between two nations especially and the success of the Bi-National Commission is centred on stability and effective and acceptable means of ensuring and enforcing law and order within any country so that business can flourish and the economic emancipation of people can then be realised and ultimately this is what we are aiming to do," he said. "In accepting this particular support of 55 million Rand I would like to state that this is quite a clear testimony of what our brothers and sisters in South Africa can do in order to enhance the capacity of areas and gaps which could have been identified. "When a neighbour's house catches you don't ask who caused it. You just go and extinguish the fire and later on you can then investigate who exactly did it when it has been extinguished." Gift of Givers founder and Chairman Dr Imtiaz Sooliman handed over a package consisting of medical supplies, school stationery and other immediate personal needs. Dr Obadiah Moyo said: "On behalf of the Zimbabwean people, we welcome the gift; and this shows the strong bond of friendship that exists between the two countries. This is a true, life saving friendship between the people of South Africa and Zimbabwe".